I personally love playing doubles. I feel like a totally different player when I play doubles. I feel like I have more control over the game, everything seems much simpler. Maybe I just don’t feel so alone, I can’t tell. If you want to play well in table tennis doubles, you need to practice the techniques, footwork, hand signals, and the most important thing is the tacit understanding between two players. Not every player can be a doubles team with any player. There isn’t really a standard to follow to be able to say this style go with that style etc. For playing doubles, it is just like finding the ideal couple for you to married to. It is not for you to find the top player to partner with, rather, it is for you to find the partner that can match with you perfectly. Two players with totally different playing style can even become a great partner. You can see that many double teams that are coupled with two top players tend to not have a good performance during the competition. Most of the time, they are playing even worst then the teams that are produced with an advanced player and lower level player. The best team that one can produce is having a lefty and a righty to play the doubles game. They are having better advantages compared to two right-handed or two left-handed player team. This is because a lefty and righty team have an entire table open to the player who turns to receive the shot. The player does not have to cover a great distance for his partner to play. For both lefty or righty doubles team, every time after hitting the ball, Player A will have to run to the back and around Player B. A player cannot move to the side of another player as this may get them stuck on a side. This will leave the table open and the opponent will have a chance to make a killing. While for a righty and lefty doubles team, Player A just needs to move a little to the back and side and Player B will be able to cover the entire table with his forehand facing Player A. After hitting the ball, Player B can step back and Player A can come in to make the shot. They won’t get stuck or collide with each other. Is table tennis doubles played the same way as in a singles game or are there any differences in the rules? 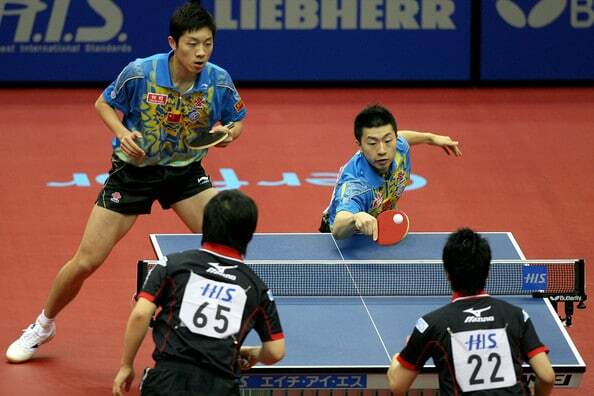 Doubles game in table tennis involves two players on each side of the table, making four players altogether. The doubles game is played the same way as a singles game but there are some differences in the rules of the game. In a doubles game, a line is drawn along the axis of the table dividing it into two equal half courts, 3 mm wide which runs parallel with the sidelines. Some of the rules for doubles table tennis is different from the rules for playing the singles table tennis game. So what is the difference between a doubles games and singles game in table tennis? There are differences in the order of play and in the serving rules from a singles game. The first difference is that players must alternate shots. If one player of a doubles team plays the ball two times in a row, the team will lose a point. This means that if in a match where there are player A and C versus player B and D, A is the server and B is the receiver. The order of play will be Player A serves to Player B, Player B returns to Player C and Player C returns to player D. The rally will continue until a point is scored by either side. The serving sequence in doubles game is different from the singles game. In the order of service, after each 2 serve the previous receiver will become the server and the previous server will become the receiver. If the order of play is A to serve B and B to return C and C to return to D, the order of play after the change of service will now be B serve to Player C and C returns to player D and D returns to Player A. In the doubles game, the team that has the right to serve first decides among themselves which of them will serve, but this can only happen in the first game of the match. The first receiver becomes the first server in the second match, that is if player A serves to player B in the first game, player B will now be the first to serve in the second game of the match. The pairs change sides when they reach 5 points in the final game of the match and the team that receives changes receiver. This means that, if the order of play before the pair scores 5 point in the final game of the match is A to serve B and B returns to player C and C returns to player D, the order of play after 5 points in final game of the match will now be, A serves to player D and D returns to player C and player C returns to player B. However table tennis doubles rules are a little bit different for wheelchair players; After the return of a serve any of the players can return the ball unlike in normal doubles game, but the players remain in the positions on the side of the table because if they don’t they will lose the point. I hope that I have been able to explain the table tennis rules for doubles to you the way that you will understand, but if you are still not satisfied you can contact me and ask any questions and I will get back to you ASAP. You can also read the ITTF official table tennis rules specified in the laws of table tennis handbook. If you play in a table tennis club you can find a partner to practice and master the doubles game. I hope that one day you will become an Olympic medalists table tennis doubles champion. In the table tennis doubles, you may see the players gesturing with a single hand under the table before making a serve, you may wonder what the heck are they actually doing there? When playing doubles, the hand signal is quite important. It is a signal that you want to inform your partner on what type of serve you going to make so that your partner can predict how the ball will return from the opponent once you trigger the serve. The opponent didn’t receive the ball. This is the optimal scenario. The opponent rushes to receive the serve, and the returning quality is not good. This is the second ideal scenario. My partner can fully prepare for a strong offense. The opponent identifies my serve and makes a fast attack. My partner will need to have full awareness of the defense across the board. The opponent returns the ball to the net. This is the optimal scenario. The opponent returns a chopped back to the back of the table. This is the second ideal scenario. My partner should be prepared to take the arc-spinning attack as the best strategy. The opponent’s chop backs the ball close to the table. My partner needs to be prepared to chop or flick the ball. The opponent forcibly took an arc attack from my serve. My partner should be prepared to defense across the board. Different players will have different hand signals when they are playing in doubles. The main important things are they need to be simple and easy to understand. Point the thumb up: indicate doing a topspin serve. Point the thumb to the left: indicate the drop point will be on the left. Point the thumb to the right: indicate the drop point will be on the right. Point the thumb down: indicate you are doing a backspin serve. Open five fingers, swing 1-2 times left and right: indicate non-spin serve. The hand stretches forward to the left: indicate the drop point is more to the left far to the table. The hand stretches forward to the right: indicate the drop point is more to the right far to the table. Five fingers hold as a fist and turn to the left: indicate the drop point to be on the left and near the table. Five fingers hold as a fist and turn to the right: indicate the drop point to be on the right and near the table. There is no standardized hand signal for table tennis doubles. As long as the two playing partners have communicated in advance, and agreed on the signals, then is good to be used. In the professional competition, it is not the player who serves to give the hand signal. Instead, is the partner who going to receive the return shot from the opponent who gives the signal. This is to ease the partner to make good preparation as he can expect how the opponent will return the shot. In the table tennis doubles, the requirements of the footwork are higher than the singles. This is caused by the impact of the venue, in the course of the game should try to avoid the collision. If the pairings are with one left-handed player and one right-handed player, then the footwork is relatively simple. They can move based on the “8” footwork. That is, the left-handed player returns to the back of the left half of the table after hitting the ball, and the right-handed player hits the ball in front of the ball, and repeat accordingly. If the two right-handed or left-handed players are playing in the doubles, the footwork requirement is higher than the pairing of one left-handed and one right-handed player. At this time, the triangle footwork is generally used. We take the right-handed pairing as an example. When the ball is in the forehand area, the clockwise footwork is used. That is, after A hitting the ball, he will move clockwise to the rear side of the B. After B hits the ball, he moves in the same way as A, just like moving clockwise in place. When the ball comes to the backhand area, the counterclockwise footwork is used. However, the actual route of the ball is not fixed, and the double player’s usual practice is required to develop a high sense of tacit understanding. In the training, the two players from Team A consistently return shot to a drop point at Team B, and ask Team B to move back and forth in the range of half a table to return the ball to Team A. This is to improve the Team B to control the ball and familiar with their positioning. For multi-ball training, two players in doubles can practice with a trainer. The trainer can hits the ball to a certain point on the doubles’ side. Since the trainer does not need to move, the speed of the ball is relatively fast, which makes the training and footwork position of the doubles to become more difficult. The effect is better than two players train with two players. This training method is equally applicable to two pairs of double players. Both teams need to hit back the ball in continuous moving to increase the difficulty of training. In order to enhance the ability to react and judge, the training and technique are closely combined. When do the training in doubles, Team A can also do a consistent attack at some drop point, and then make a sudden attack to another drop point to test the reaction of the players. Team A can hit the ball freely to any drop point, and Team B must return the ball to the specified drop point (left corner or right corner) while moving. This often happens in doubles competitions where Player A is weaker in the left corner and Player B has a certain loophole in the right corner. In response to the obvious weakness of the opponent, we are required to make full use of various lines to hit the ball to the shortcomings of the other party. This not only helps to suppress the opponent’s offensive attack but also creates offensive opportunities for the companions. This training method can also be practiced with multiple balls and practiced by a trainer to improve the ability of two players to control the return point of the ball while moving. In addition to the above training, the double players also need to be trained on the front and back step movement, and the counter-attack training while moving. These are several pieces of training for doubles players. But the dominant thinking must be very clear: all the means in training and competition are to better develop their strengths and strive for the initiative. Therefore, in the above training, different players can train in different ways according to their own playing style and technical expertise. Affinity is the most important consideration when doing pairing combination. Close affinity can form an excellent combination because of their mutual attraction. Both players should have their own characteristics in terms of technology and techniques. They need to be able to complement each other and integrate into one to form a tacit understanding. Wang Tao and Lu Lin, the men’s doubles champions of the 25th Olympic Games and the 42nd World Table Tennis Championships, rarely spoke in the game, but they cooperated very well with each other. It is best to have one lefty and one righty to form the doubles team. This is to avoid collision and they can play very fast with their movement. Players who have good ability to control the ball are ideal to play in doubles. They can make the shot with an accurate drop point and having fast movement. Because after some time, both players have built up mutual understanding and familiarity. The coach cannot rush to make up or changing the partner when the competition is approaching. One can play fastball and the other can play slow ball. Therefore, they can complement each other. Get two offensive or two arcs players to form the doubles team, with a lefty and a righty. One is good at close table attack, and the other is good in far table offensive play, or one is good at forehand attack and the other is good at backhand. Having one pips in player to pair with one pips out player. This is the doubles that can play offensive and defensive in the game. One player stands close to the table to do the push. Another player stands slightly behind. They should focus on to generate more spin when chopping the ball, and find the opportunity to make a strong counterattack. If both are skilled players and have refined techniques, they can try to match with each other to form the doubles team. The threat of such a team combination can be very huge. I also feel like a different player (better, that is) when I play doubles. I have more control over the game, in decision making as well as ball placement… everything seems easier indeed! Thanks for this post!